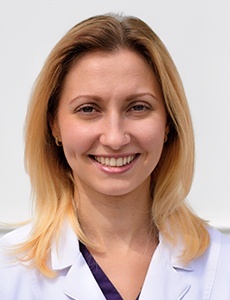 Dr. Horokhivska first started here at Dental & Cosmetic Solutions as a dental assistant, and our practice was thrilled when she returned in 2015 to work alongside Dr. Pastouk as a dentist in her own right! Dr. Horokhivska is originally from Ternopil in Ukraine, and she’s married to her college sweetheart. Her interests outside of dentistry include yoga, dance, nature, and working out. She actually speaks three languages – English, Ukrainian, and Russian!